Awestruck….I’m still in awe from an opportunity I had last Friday. Last week, I my radar class visited the radar site for Denver (KFTG). That giant tower you see above…yeah that montrosity is it. It sits on 12 feet of concrete underground and puts out so much power (750 kW), if you put a hot dog close to the transmitter, it would get nice and krispy. But that’s not why I am in awe. I mean that thing is awesome but it wasn’t the thing that inspired me. That would be the woman who led the field trip. Her name is Nezette Rydell, and she’s the Meteorologist in Charge at the Boulder National Weather Service. Yep, I had to Google her name because it’s not a name you come by often. Nezette looks like a sweet Texan grandmother. She doesn’t give off a standoffish vibes I noticed from other meteorologists and had a real interested to talk to my fellow students and I. But when she opens her mouth, that’s when your jaw drops. Well, I wasn’t expecting that! Not to say women don’t know their stuff. It is just since I started my meteorological scholastic career I’ve only heard from men. I mean, every single conference I’ve been to or class I’ve had, a man is the one spouting out the technical jargon. And if I can say quite frankly, the way she was able to explain something so technologically advanced, it made me so happy! As a female budding meteorologist, I feel like I’ve had a little bit to prove within myself. Coming from a journalistic background, it has been a struggle to train my brain to do the math and physics. And, for the most part I’ve been in a lot of male dominated classes, where usually the people who are able to answer things out-loud (even though a lot of my female friends also knew the answers) in class are all…men. And I am not ashamed to say, I’ve also heard sporadically throughout my life that men are better at the sciences then women. So just to see a woman, who is the big boss at I would say one of the hardest Forecasting Offices to get in to (seriously, you need a PhD or at least a master’s degree to even be considered) be able to spout of all this technical jargon and to just show how smart she is….I can’t even begin to describe how inspired I am. It makes me realize, as a woman, that I can go and do well in this field to. I can know all this jargon and that either I or any of my female counterparts could be the MIC (Meteorologist in Charge) of their County Warning Area. We can be chief meteorologists. And because we are also learning how to code and work in fields of instrumentation, there is no telling what the future holds. Needless to say, I have hope for the future. And that, makes it all worth it. I missed you all so much. Now that I have fully been on vacation and have figured out how I am going to attack this semester. I can happily announce that I am back to blogging. So let’s start with this weekend. The picture above is from, I kid you not, the view from our porch of our cabin for the weekend. I seriously love Colorado. Although I can’t tell you exactly where this picture was taken because the place where I was is particular about media coverage I can tell you it is somewhere in between Estes Park and Nederland on Peak to Peak Highway in Colorado. The nice thing is even though things are starting to cool down here, it is still warm enough to get around and hike a bit. It is also still warm enough for wildlife to be out. I was lucky enough to see some deer over the weekend too. I literally just shut the door after taking the dogs out for a hike when a herd of deer swarmed my cabin. There were 4 in total (One buck and 3 does) and they seemed happy enough to graze around while I frantically search for my phone to take a picture. The pic above is of the one straggling doe that stuck around just so I could get her picture. But my weekend was not just all fun and games. I also got in a lot of reading too. If you are geeky about meteorology and want to learn about radar, I highly recommend this book. I am currently reading this because I am taking a course in radar and satellite at school however, the professor who wrote this book sells these on his website for about $40. Just thought I would write a little update for you. Hope to have more interesting blog posts soon. You know what all that red means on the map above?! It is going to be in the 70s this weekend! Yep, following last week with the bitter cold and snow…we have sunshine in the forecast for this weekend! But beware, some more cloudy weather may be ahead for the next week. I’ll keep you posted as always on this blog. As you recall, the reason for last weekends snow storm was a low pressure system that came from the Pacific Northwest. That low, by the way, has almost worked its way to the East Coast by now. Friends on the East Coast, you will have some stormy weather to contend with this weekend. But true to the way things go in the atmosphere, the high pressure system has taken over and high pressure= gorgeous sunny weather in springtime. And with the high pressure and more clear skies brings more solar radiation which brings warmer temps to our area. But this nice weather may end soon. We have another low pressure system that may affect our weather in the next week. As seen in the picture below, a low will form over Montana and Wyoming at the beginning of next week. We are at the bottom of the low in Colorado, but it could very well affect us soon. Some models are projecting almost an inch of rain on Tuesday, but I like to have caution and will say we won’t get much rain in the beginning of the week. I will be keeping an eye on the weather as always this weekend. I will have more on your next work week on Sunday. Until then, enjoy the sunshine! A long time ago (in a galaxy not so far away), I had a TV meteorologist who I used to work give me some advice on going back to school. The one thing she said to me that really stuck (besides, well going back to school would be tough. I mean that was pretty important too) was “The way you look at the world will never be the same.” And ya know, she was right. Little did I know how right she would be. That now instead of just looking up at the skies and seeing clouds or watching it snow or even trying to calm my dogs down during a thunderstorm that I would see it all differently in just a year of meteorology school. Now I see a entirely different world than the one we are currently living in. I see clouds being formed by evaporation from the Earth and oceans with so many little water droplets being suspended in the air. I see layers of the atmosphere that each have their own characteristics that make them so unique. Like in this Skew-T screenshot I took a few days ago. It may look like squiggly lines and numbers to the untrained eye but this tells weather folk about different levels of the atmosphere, it’s temperature, the winds in each layer and even where the possibility for precipitation will occur or even how spinny (yes, spinny. Don’t shake your head at me.) a storm could become (i.e. tornado). Instead of it being breezy or so windy it could knock you and your loved one over, I not only think, we should really get inside, I wonder where did the wind come from and where is it going? Is it just winds traveling from high to low pressure or is part of a front too? Pic from a website that not only shows you where the winds are blowing on a map but also how fast they are going. You can see all the current winds in the world and where they are headed. And even while I lay here in bed, writing this to you, and wondering if the symptoms from my migraine will ever end, I feel joy from looking outside my window at the clear blue sky and knowing that we are currently in a high pressure system. No matter what happens with people or your day or even what will happen in the future, there is an entire world going on around you that is so complex and beautiful. And I am really lucky I get to study it. So yes, she was right. It isn’t the same. And I don’t ever want to go back. So thanks for the advice! Happy Thanksgiving one and all! I hope you are all enjoying the festivities today! I know my house most certainly will be filling up on lots and lots of turkey and all the other yummy things. Have you ever had a time where you were extremely thankful for one thing in your life? It could be your kids, your family or your job. This year I am most thankful for my health! You see, as of this summer, I started dealing with a crazy mold issue. I found out that the carpet in our home is super contaminated with mold spores! Not like a normal level (which is in the 10,000 range), but in the very unhealthy high level (2 million mold spores per affected room!) This problem also led to really bad health problems this year including having a hard time breathing! At this point, you might be asking, “This is a weather blog. How does this relate to weather?” Well believe it or not, it is a meteorological issue! I didn’t know this until I hired an air quality specialist to come to my house and do an air quality study on my home. Turns out, the specialist is a meteorologist and has a PhD in Atmospheric Science! Yet another tie in to weather and meteorology! I decided to talk about this problem at full length in my video blog above. I also talk about what I did to help get rid of it because I found that there is very little information out there about mold exposure. I hope you all enjoy the video and your day! Welcome to November! Believe it or not it is only in the high 60s today in the Denver-Metro Area. Still a very mild fall here. I wanted to show you the webinar on women in weather that I showed in my last post. It is an awesome post for anyone who thinks girls belong in science and it motivated me to stick with my studies. It is shocking to think that women are still the minority in meteorology and that there is a stigma with women studying science in math. But the women in this video talk about how they are able to get through the struggle. I didn’t know this until now. But now it makes complete sense! Did you know that meteorologists work in other fields than just the National Weather Service or on TV? Neither did I. For some reason, I’ve been introduced to a whole lot of mets who work in fields I didn’t expect. And it is pretty cool that you can work pretty much everywhere. It all started with a simple webinar a few months ago about Women in Weather. I mainly attended because I am a major fan of a particular TV meteorologist who was going to speak during the event. But little did I know that they would have mets from all sorts of fields there too! Then a month ago, I met a meteorologist who does air quality and mold tests for businesses and homes and a handful of meteorologists last week at meetup who all know how to code and work as computer programmers and software developers. It’s amazing to me that there are a lot of jobs out there that need a meteorologists help. FEMA for weather-related emergencies and wildfires. So, now you know. Meteorologists are everywhere! I hope you are all having a great start to September! As of Tuesday, Sept. 1, we started the meteorological first day of fall!!! It’s different from the astronomical in that a) it has a different date and b) it relies on weather patterns instead of the position of the earth. Today I want to talk to you about a weird phenomena going on with my brain. I am naturally a right brained person. As you can see from the picture above, I am naturally very subjective, I look at wholes and I am intuitive. 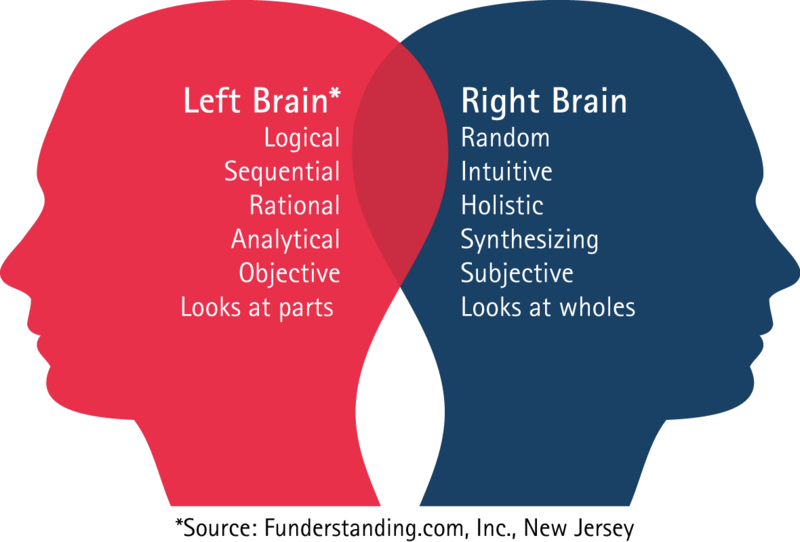 (It’s funny because the picture actually reminds me of my husband and I because he is very left-brained haha!) I can write essays no problem on a book I’ve just read, I can argue philosophy and I actually have a Bachelor’s of Arts right now. I am good at arts and I love it. At first, I was a little intimidated when I decided to pursue a meteorological degree. I remember when I read the degree requirements and going “awwwww maaaaaannnnn there is so much math!! !” I liked math and physics and LOOOOVVVVVEEED Earth Science and Geography as a kid, but my whole life was focused more on the liberal arts than anything. But, when I found out that I’ve actually wanted to do weather my whole life (I really missed the weather section we would do for a week at school and have been obsessed with weather believe it or not), my attitude changed and I was willing to take the challenge. The first few weeks of school were the hardest for me. Going back to math and learning about science was tough. But, slowly but surely a light switched on and I was able to do it! It was hard to adopt a new way of thinking. It was hard to sit and have patience to test things, to go through steps logically and not have someone tell me an answer. It was hard to see at first that math was useful for real life situations. But, here I am! I’m not afraid to step in a physics class with all the boys and give them a run for their money! The lesson I’ve learned is you can change and you can accomplish your dreams no matter how scary things seem. If you didn’t do well at it before, maybe now is the time you can do it! And, my little pitch to girls out there who would like to do science but think it is a “man thing,” don’t be scared because you can do it! Even though life is hard…pushing towards your goals and making them happen now is much more rewarding.